I’ve had a thing about pigs for quite awhile. Hub started liking them before I did (actually neither of us can remember who started it now, lol), and we have a small collection of pigs in the house. 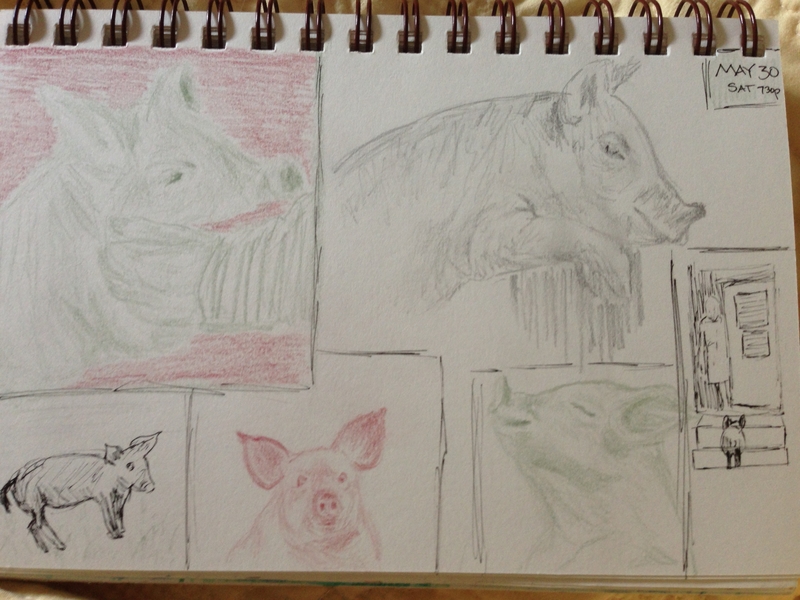 We may have more soon, as I’m not sure where my little pigs-within-my-art journey will end, but I hope my little piggies inspired by Kirk’s post bring a smile to your Monday morning. These were all sketched from stills in the video. Hub & I made lots of progress organizing the studio/sleep cave yesterday. We have workspace, people! (Yes, it’s every bit as great as liftoff.) Happy Monday, Happy June….and I hope you smile like a pig eating pretzels. Its always difficult trying to draw and paint subjects which are forever on the move – well done. I paused the video and drew from the stills, or they wouldn’t be nearly as detailed, I think, but thanks Graham! I appreciate your comment. If every commercial could be so cute! OMG – that video is so stinking cute…… I’m so glad he kept her. 🙂 And your drawings are so much more sweet after watching the video. Love the one at the door. BIG Smiles on this Monday morning. Thanks for sharing Laura! I’m so glad you enjoyed it. The one at the door is one of my favorites. How could I skip over that scene? Oh that video is priceless. I’m so glad you enjoyed it, Jodi. Have a great week! PS that was also my reaction. I’m so glad he kept her. I really hope they are real because that man and that pig IMO are meant to be together! Thanks for the shout out! Nice drawings. That little guy had character and I see that in your sketch. My pleasure Kirk, and thanks for the great drawing fodder. I may not be done with that little pig. 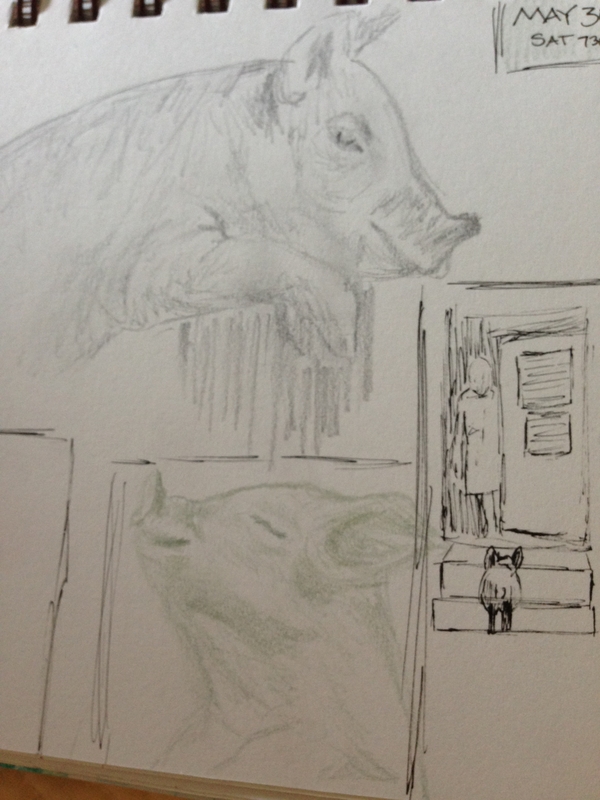 My favorite one (but it’s hard to see in the pale green and with no ink definition, I decided to leave ink out of the colored pencil drawings) is the smiling pig in the lower right near the inked pig at the door. The pig had just bitten into the pretzel the man fed him in the truck. Oh, priceless smiling pig! I can’t tell you how much I enjoyed that video. It is really well done, isn’t it? 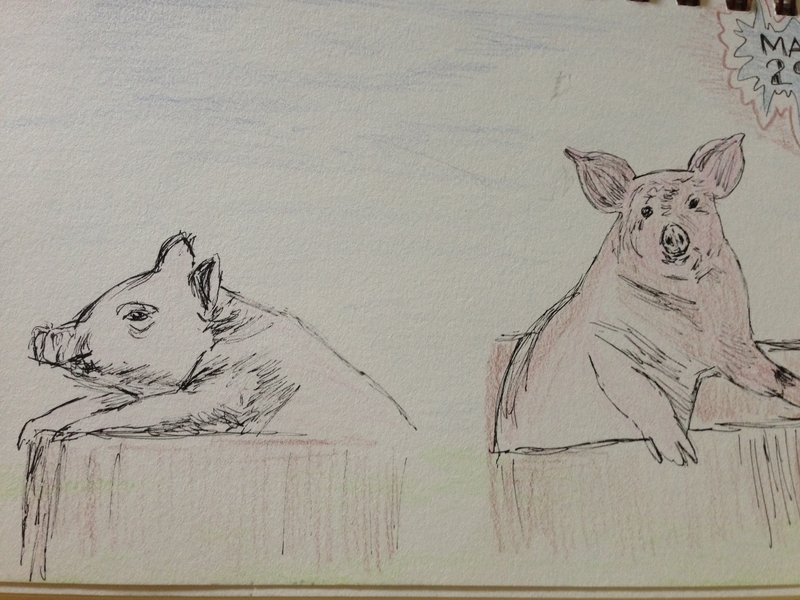 I’ like the little captions of the pig, seeming to say so much. They are very smart creatures, I understand. Yes! I find this one to be as readable as dogs usually are. So much to be found in her little expression. Once he’d named her, I had a feeling he was a goner and wouldn’t be able to let her go. Piglets are adorable…grown 300lb pounds, sometimes not so much. 😀 Your piggies are very cute! I, too, try to draw watching things on TV, like nature programs. It’s really hard to! Because I’m usually watching them with the family, I can’t even pause the show and so the drawings are quite gestural and incomplete. Yeah that’d be much harder, especially when the subject is small! Good idea though. This little piggy cried weeeee weeee weee – all the way to your artwork. Cuteness. Oh, and funny thing – you did that Gollum comment with “precious” and that was the exact word my friend used to describe the watercolor I did for her of the palm and beach. How ironic. : ) Thanks again for all of your encouraging words. 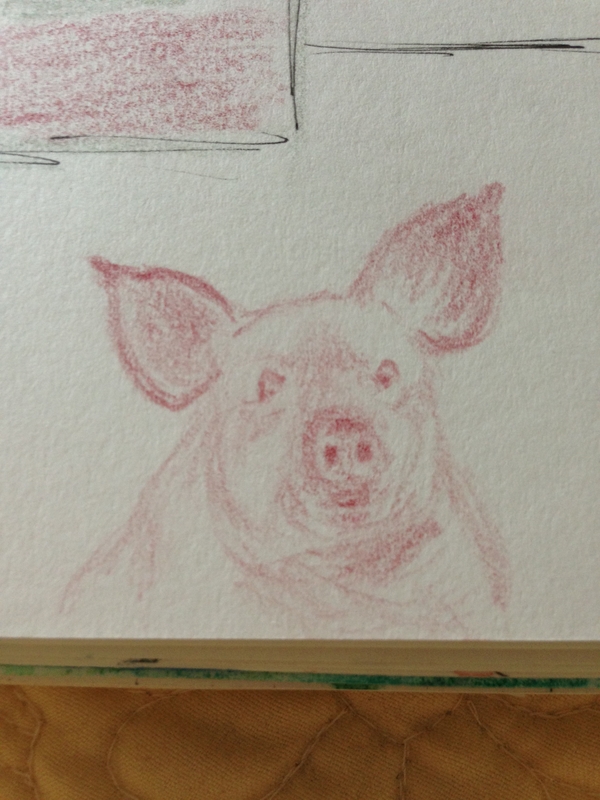 Question – what color pencil are you using for the piggy? Pink, red? You captured their personality. Love the first sketch in ink. Thanks! I’m glad you enjoyed it. Oh that pig had such a huge smile biting into those pretzels! 😀 I could have adopted her myself. She’d still get pretzels here, just gluten free ones. She may not have as big of a smile if she were here LOL. I like the little pigs. I know. 😔 My body (and my daughter’s) hates it. It made me v sick for many years, but I had no clue….now I’m off it, and still recovering. I can’t tolerate corn either, and that’s in absolutely everything. The only thing I didn’t have to change (every product I use or eat) to get away from corn was my contact lens solution. I do think wheat is good for no one. Hub went off it to support A and I, and he feels better without it and won’t go back. He added organic meat and eggs, got off wheat (and got off egg beaters) and his cholesterol numbers went down. Believe it or not! Hi Laura! Would have responded sooner but major storm in my area so the internet has been down. I think going gluten free would be beneficial to me too as I have lots chronic pain & arthritis, etc so it would probably help but it’s really hard to make diet changes. Any suggestions? Sure, Jill, I’d be happy to help. One website that’s been great is http://www.elanaspantry.com. She’s written several cookbooks too that are wonderful. Another book that really helped me (info, tips and recipes) can be found at this link: http://www.whole30.com/whole30book/. I started with “It Starts with Food” and now they have newer ones too. My doctor suggested I go gluten free for 30 days, and I was in enough pain at that point that I jumped at the chance to end it and dove right in. But if you’re not there, I’d say just try it for a couple of days and see how you feel. (I noticed a few changes after two days, and lots more after two weeks. Not saying you’ll have the same experience, but …). The other thing I’d suggest is google this: 300 symptoms of gluten intolerance And see if you see yourself in that list. That might motivate you, if you do. I’m sorry to hear about your pain and arthritis issues, but I believe going GF could help you with both!! Sometimes just knowing there’s hope makes a huge difference. Aww, aww, aww! Love your drawings. Going to watch the video now. Thanks, Carol. :)). I hope you enjoyed it.